In 1993, artist Yu Ling was born when Lucy Liu aimed to separate her artwork from her onscreen work. Yu Ling is the actress’s Chinese name, which she initially used as a pseudonym to publicly showcase her paintings. This all changed when Lucy shelved her alias because: “I realized that people are always making judgements about what I’m wearing or who I’m with, so why not allow them to see something that’s a real part of me?” the actress told Evening Standard. Though many recognize Lucy for her work as an actress — Ally McBeal, Kill Bill, Charlie’s Angels, Elementary — she is also an artist who developed a love of painting at a young age. Now, Lucy is continuing her lifelong passion for art by partnering with LIFEWTR to push conversations about arts in education. To learn more, we followed up with the artist, actress, and mother after she taught an art class at a NYC public school. HelloGiggles (HG): Where did your love of the arts come from? 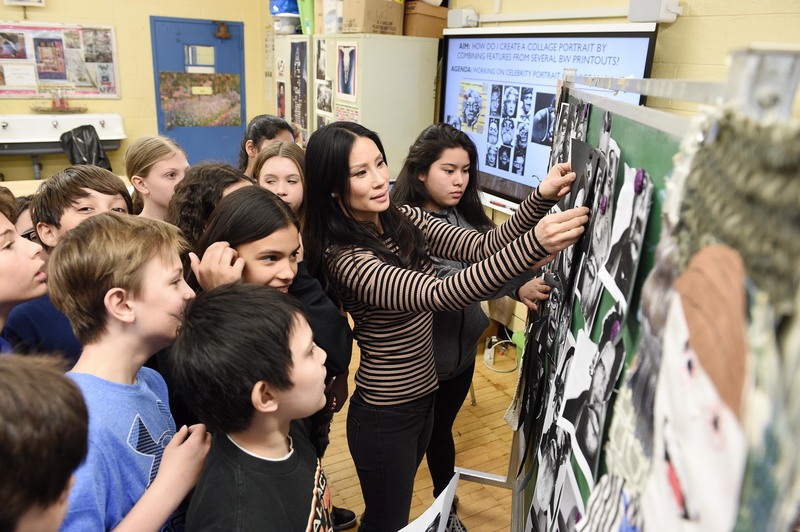 Lucy Liu (LL): Actually, it started in public school. I was actually talking about it earlier with someone. We didn’t really focus on art at home, so the only opportunity I had was when I went to school. And that’s where it started. Now what they have going on is that they’re cutting art programs in school by 80%, which is a lot. Even the school that I went to today with sixth graders — we did a little collage project in their school — they only have art once a week, so that’s not a lot and a period is pretty short, like 45 minutes. HG: Specifically considering our current political climate, why do you think arts in education is so important? LL: Art inspires people and it’s a really wonderful form of expression that is peaceful. It’s a vital way to communicate and to form a community. I think what I was discussing earlier with some friends was that what I loved about the project we did today in school was not so much the result of the collages that they had created, but really it’s the community that was seen when the kids were working on them together. They were talking, they were laughing, they were sharing, they were asking each other to pass the scissors and the glue. It’s really a sense of how people become socialized — not just about the end result. That’s something I think we’re ignoring more and more. With technology being so advanced, we’re all so focused on our computers or on our cellphones — I think it’s vital to really emphasize talking to each other and engaging. HG: Considering movements such as #MeToo and Time’s Up, do you think that women especially can benefit from the arts? LL: I think anyone can benefit from the arts, but you know who’s going to benefit the most are kids…I don’t know if you saw this wonderful movie that they put together, but LIFEWTR put together this video about children…They interviewed them and gave them the opportunity to make and create art. Then they gave the same opportunity to adults, and the adults were so inhibited and they felt stagnant and they were scared. Kids don’t have that. [Kids] have this freedom, they have this openness, and that’s when we’re going to learn the most — when we’re open. Not when we’re older and we become a little more set in our ways. I think the kids can benefit from this the most, and of course we grow up to be women and men and yes, that is something that we take with us for a lifetime. HG: Many moms out there find it hard to make time for passions or side hustles such as painting. What would your advice be to them? LL: The thing is there shouldn’t be that much pressure, that’s the thing. Because that’s a wonderful way to engage with your kids or even if you’re busy, you can just put out some pencils or crayons and paper and glue, and let your kids explore while you’re in the kitchen cooking. That’s what I do oftentimes and my son is only two-and-a-half years old. Obviously you don’t leave scissors with a kid who can’t handle them, but you just let them explore and express themselves. Kids have a natural curiosity, and they’re going to draw and paint off the page, but that’s what’s great about it. They don’t feel like there are boundaries. That’s why LIFEWTR and I have that common goal of promoting art in school. They have this wonderful program, #BringArtBackToSchools — you can talk about how art inspires you or how it’s changed you, and they’re going to send out art supplies to schools. This is going to also make it exciting for kids in these schools, [so they] have something to look forward to. HG: Especially for minorities and underrepresented groups, this is extremely important. Are there any female or minority artists out there who are currently inspiring you? LL: I don’t think in terms of minority, I just think in terms of artists. I think that there was an article in The New York Times not long ago about how female artists are not as recognized or not as well paid, and I think that, to me, you’re going to see a shift in that. I think there’s no way to not recognize that things are changing in society now, and of course there’s movement towards that. That’s the way it has to be and I think the kids are at the foundation of that, to be honest with you, because they’re going to be the next generation to go and to be involved, and I think now kids are more involved than ever. HG: Are there any specific artists who you think people should be paying attention to right now? LL: I really love Laura Owens. I think she’s very inventive and creative and open, and she always engages other artists. She just had a retrospective, downtown, at the Whitney [in New York], which I thought was really beautiful. And of course, Louise Bourgeois had a beautiful show not long ago at the MoMA, which was exquisite. Unfortunately, she’s no longer with us, but you can see that her work comes from the heart, and from her history of her life and her mom. People are like, “Why is there a giant spider, why does she keep focusing on spiders?” Her mother was a seamstress and she was very particular and very specific, and so she connected the analogy of the spider being so meticulous and weaving and weaving and making all these perfect things. That’s how she associated with her mother. Suddenly, this scary arachnid — it’s not about that, it’s not about arachnophobia. It’s about this wonderful, beautiful creature that was so meticulous and would create these wonderful webs — just like her mother. You suddenly associate a mom with that and it becomes something very spectacular and different. It changes the way that you see things. What we did today in the classroom is we took pictures of people, and they were able to rearrange and change things, and the kids came up with the most beautiful inventions that were a person’s face. They took somebody’s hair and made it a beard, they took something else and the necklace became an earring. It was just things you do not think of, and these are sixth graders. We need to keep pursuing and pressuring people to recognize how important art is — because it’s not just about art, it’s about how these kids’ imaginations will turn into adult imaginations, which will come up with inventions and a way to think outside the box. That’s what it’s about. HG: If people out there want to take action and help with arts in education, what do you think their first step should be? LL: I think the first step is to really talk about art; put down your cellphones and engage in art. It’s not that difficult. Go to a museum. Support your local museum. Go to the library. I go to the public library. I have a library card, and we go in there and we look at all the different things there are. I’ve taken my son to the museum before when he was nine months old. It’s about seeing things in a different way, and recognizing that the public schools and public libraries and all those things have all these wonderful treasures for us to explore. We have to engage in those and to not forget that. HG: Statistics show there is a lot of work to be done when it comes to Asian representation in Hollywood, and that’s something you’ve been vocal about. How do you see the state of representation today? LL: I think it’s changing very quickly. It still has a lot of work to do, but I definitely think it’s changing. If you look at the vast amount of content, you see more diversity, but it’s something that has to be pushed — absolutely. Now they’re even trying to promote female directors and female producers, and also equal pay. There’s a long way to go, but it’s on the table. HG: Lucy, what can we expect from you in the future? LL: I have the premiere episode of Luke Cage for Season 2, which I directed, that’s coming out soon. And I’m going to do an art show myself, an exhibit that will be in Singapore in the fall. I’m [also] directing on Elementary. There’s a lot going on, it’s a very exciting time. You can get involved and help #BringArtBackToSchools in your area by sharing your story, zip code, and #BringArtBackToSchools @LIFEWTR on Twitter. In return, LIFEWTR will send art supply kits to select schools.